Yeah, no more ads! Memorial has been sponsored successfully. Your suggestions have been submitted and will be reviewed by the memorial manager. Your edit did not contain any changes from the original. Thank you! Your suggested merge has been submitted for review. The Photo Request has been fulfilled. 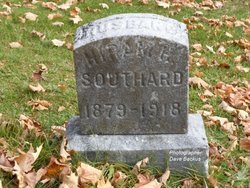 Find A Grave, database and images (https://www.findagrave.com : accessed ), memorial page for Hiram H. Southard (1879–29 Nov 1918), Find A Grave Memorial no. 80049015, citing Maple Grove Cemetery, Horseheads, Chemung County, New York, USA ; Maintained by Backus Family History (contributor 47039629) . your computer for Hiram H. Southard memorial. Oops, some error occurred while uploading your photo(s). Oops, something didn't work. Close this window, and upload the photo(s) again. Make sure that the file is a photo. Photos larger than 8Mb will be reduced. All photos uploaded successfully, click on the <b>Done button</b> to see the photos in the gallery. Photos larger than 8.0 MB will be optimized and reduced. Each contributor can upload a maximum of 5 photos for a memorial. A memorial can have a maximum of 20 photos from all contributors. The sponsor of a memorial may add an additional 10 photos (for a total of 30 on the memorial). Photo request failed. Try again later. Please note: You are asking volunteers to find and take a photo of the headstone. Please enter location or other information that may help the volunteer in fulfilling this request. Include my email in message to volunteers. You are only allowed to leave one flower per day for any given memorial. Oops, we were unable to send the email. The email does not appear to be a valid email address. Verify and try again. I thought you might like to see a memorial for Hiram H. Southard I found on Findagrave.com. This memorial has been copied to your clipboard. Are you sure that you want to report this flower to administrators as offensive or abusive? This flower has been reported to site administrators for review. The flower will remain visible until an administrator has reviewed it. Failed to report flower. Try again later. Are you sure that you want to remove this flower? Failed to remove flower. Try again later. Are you sure that you want to delete this memorial? Failed to delete memorial. Try again later. Failed to delete photo. Try again later. Take a tour to see what has changed. Quickly see who the memorial is for and when they lived and died and where they are buried. For memorials with more than one photo, additional photos will appear here or on the photos tab. All photos appear on this tab and here you can update the sort order of photos on memorials you manage. To view a photo in more detail or edit captions for photos you added, click the photo to open the photo viewer. Flowers added to the memorial appear on the bottom of the memorial or here on the Flowers tab. To add a flower, click the “Leave a Flower” button. Family members linked to this person will appear here. Use the links under “See more…” to quickly search for other people with the same last name in the same cemetery, city, county, etc. Remove advertising from a memorial by sponsoring it for just $5. Previously sponsored memorials or famous memorials will not have this option. Share this memorial using social media sites or email. Save to an Ancestry Tree, a virtual cemetery, your clipboard for pasting or Print. Edit a memorial you manage or suggest changes to the memorial manager. Thanks for using Find A Grave, if you have any feedback we would love to hear from you. GREAT NEWS! We have a volunteer within ten miles of your requested photo location. GREAT NEWS! We have 2 volunteers within ten miles of your requested photo location. Also an additional volunteer within fifty miles. Also an additional 2 volunteers within fifty miles. GREAT NEWS! We have a volunteer within fifty miles of your requested photo location. GREAT NEWS! We have 2 volunteers within fifty miles of your requested photo location. Sorry! We do not have any photo volunteers within fifty miles of your requested photo location. You can still file a request but no one will be notified. If a new volunteer signs up in your requested photo location, they may see your existing request and take the photo. You have chosen this person to be their own family member. Enter a valid email address and a feedback message. We were unable to submit your feedback at this time. Please try again later. For Edits select Suggest Edits on the memorial page. For help using the website visit our help page or contact support@findagrave.com. To suggest a correction or addition, visit the memorial page and click Suggest Edits. To suggest a change to a cemetery page, visit the Cemetery Corrections forum. Welcome to the new Find A Grave. Make it more secure and usable. Support new devices and other languages. We would love to hear what you think. Use the feedback button at the bottom right corner of any page to send us your thoughts. You can use the "Back to the old site" link in the yellow bar at the top of each page to return to the old site for now. You need a Find A Grave account to add things to this site. There is a problem with your email/password. We’ve updated the security on the site. Please reset your password. Your account has been locked for 30 minutes due to too many failed sign in attempts. Please contact Find A Grave at support@findagrave.com if you need help resetting your password. Please complete the captcha to let us know you are a real person. We have emailed an activation email to . A system error has occurred. Please try again later. We have sent a password reset email to EmailID if the address is in our system. We encountered an unknown problem. Please wait a few minutes and try again. If the problem persists contact Find A Grave. Your new password must contain one or more uppercase and lowercase letters, and one or more numbers or special characters. We just emailed an activation code to . Please check your email and click on the link to activate your account.. Becoming a Find A Grave member is fast, easy and FREE. Display my email on my public profile page. What is a Public Name? Select a place on the map to place the pin. Translation on Find A Grave is an ongoing project. If you notice a problem with the translation, please send a message to feedback@findagrave.com and include a link to the page and details about the problem. Thanks for your help!